This year I wanted to do Something Different For my Fall Front Door Decor. Over the years I feel like I have employed every possible combination of mums and pumpkins known to man or, more likely, to woman. And I didn’t want to go in for corn stalks and bales of hay because let’s face it; this ain’t exactly Green Acres. 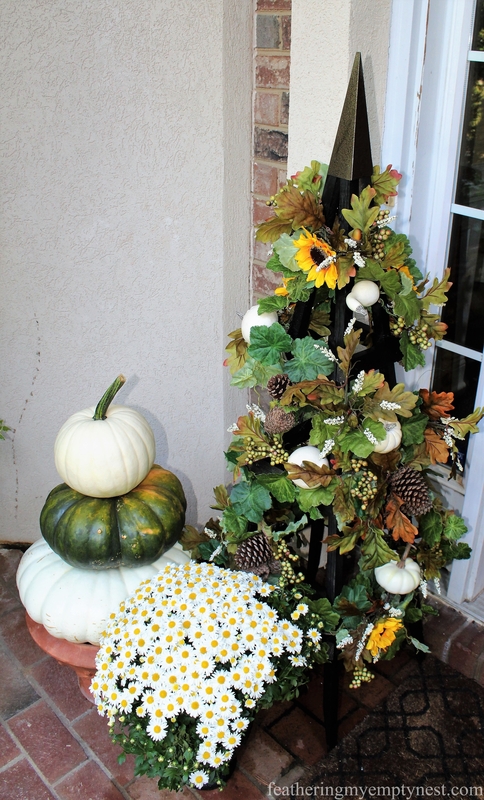 If you read my blog, you may know that I used sunflowers in the fall decorations I created for my screen porch this year. 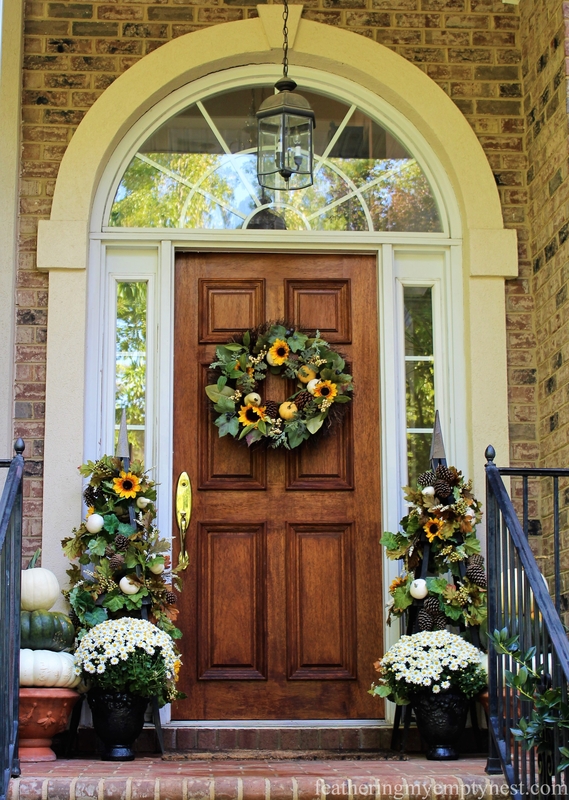 So, because I thought it might be nice to have continuity between the two outdoor spaces, I decided to include sunflowers in my Fall Front Door Decor as well. Since our house is elevated from the road, I like to incorporate some vertical elements to my front door design. This helps to balance out the two-story height of the porch roof and keeps the plants and other decor items from looking disproportionately small in comparison. Also, taller decor items are more visible from the road. Initially, I thought about using multiple large faux sunflower stems “planted” together in pots. However, I discarded this idea when I realized how many flowers it would take to be substantial enough. This was when I came up with the notion of using garden obelisks to display the sunflowers, as well as other autumn foliage and decoration. Of course, I had something very specific in mind which proved difficult to find. Don’t you hate it when you imagine the perfect thing and then you realize that it doesn’t exist anywhere but in your head? Well, I had begun to believe that these obelisks only lived in my dreams when I finally found exactly what I had been looking for on Etsy. 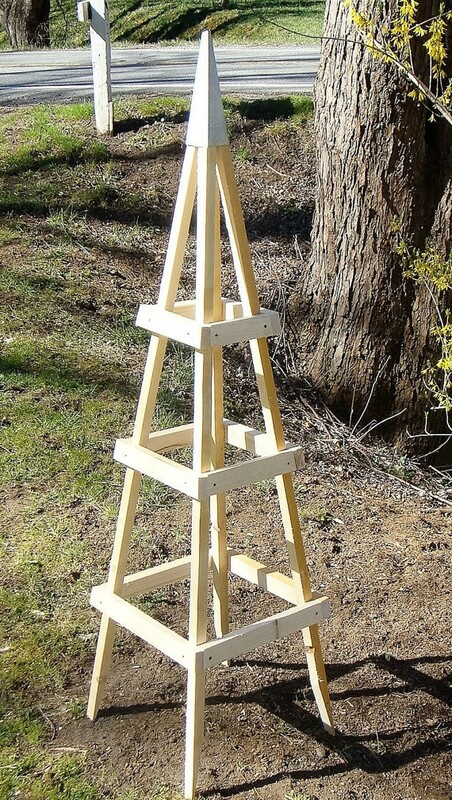 These sturdy wooden garden obelisks are made right here in North Carolina and were much less expensive than many other options I had considered. I had to put them together when they arrived but assembling them was not difficult. They were unfinished, so I chose to paint them black to coordinate with the shutters on my house. They also had decorative galvanized tin caps which I sprayed with Hammered Antique Bronze Rustoleum paint. Once the paint dried on the obelisks, I wrapped them with faux grapevine garlands I purchased on sale from Michaels. 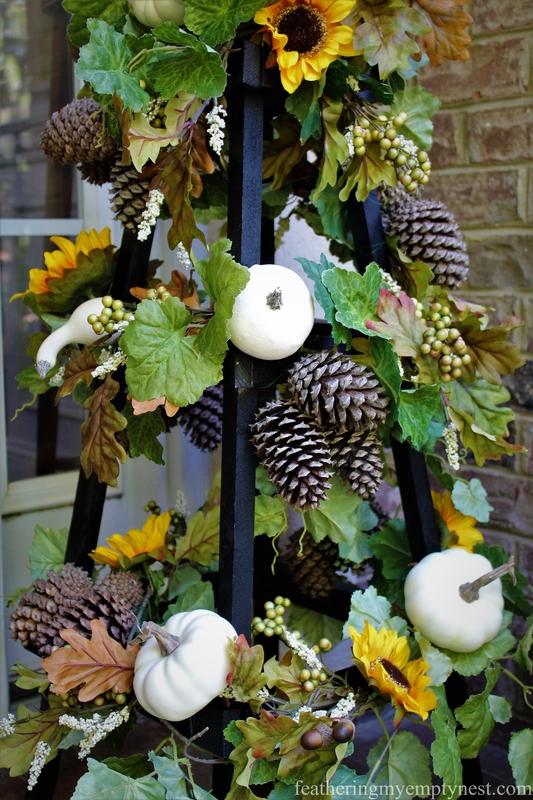 Sunflowers, sprigs of Fall leaves, berries, small white pumpkins, and pine cones from my yard add the color and interest to the structures. 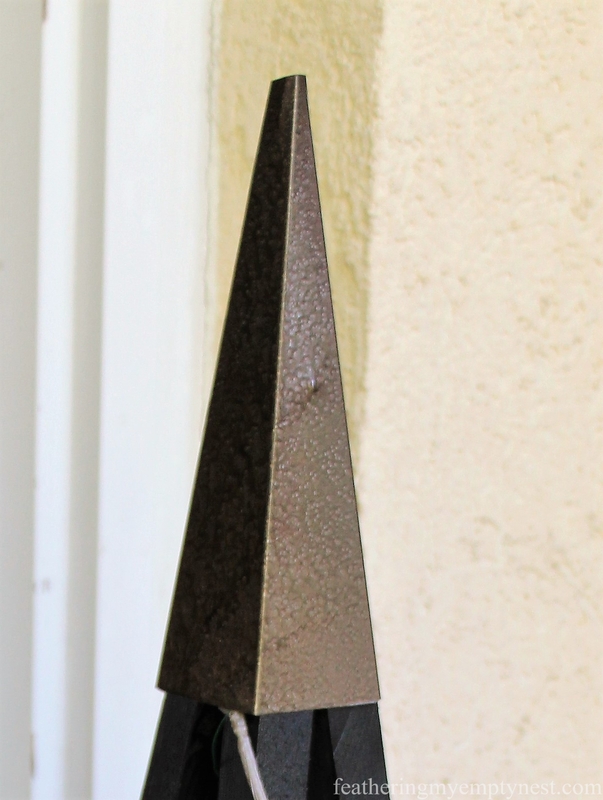 After the obelisks were completed, I stationed them on either side of my front door. 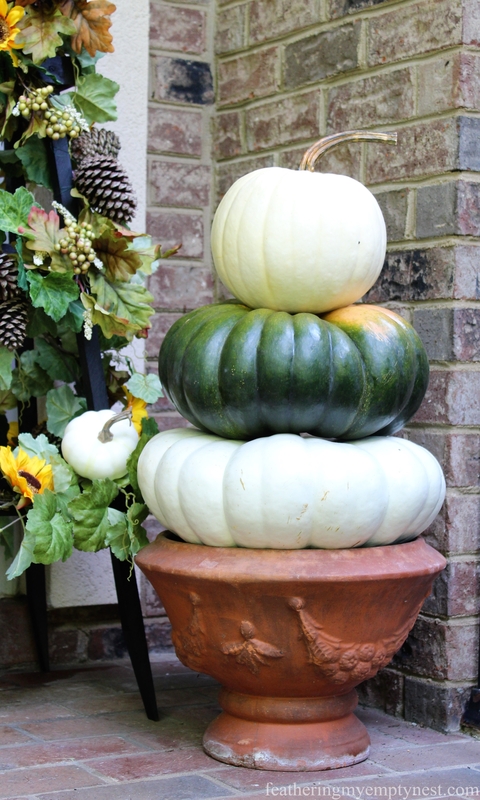 I then added terracotta planters topped with stacks of white and green pumpkins to enhance the arrangement (see last year’s Fall Front Door post, On Board With The Gourd, for tips on how to preserve your pumpkins throughout the season). Bright and cheery daisy mums rounded out the design. 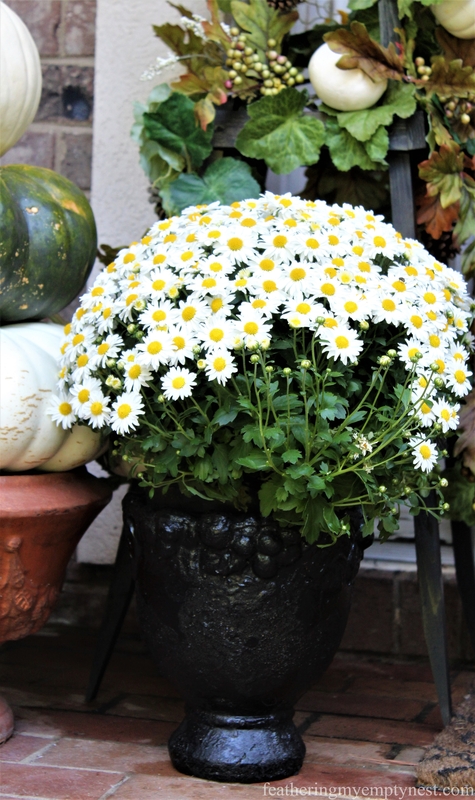 White and yellow daisy mums in a black pot tie into the color scheme of the Fall front door design. 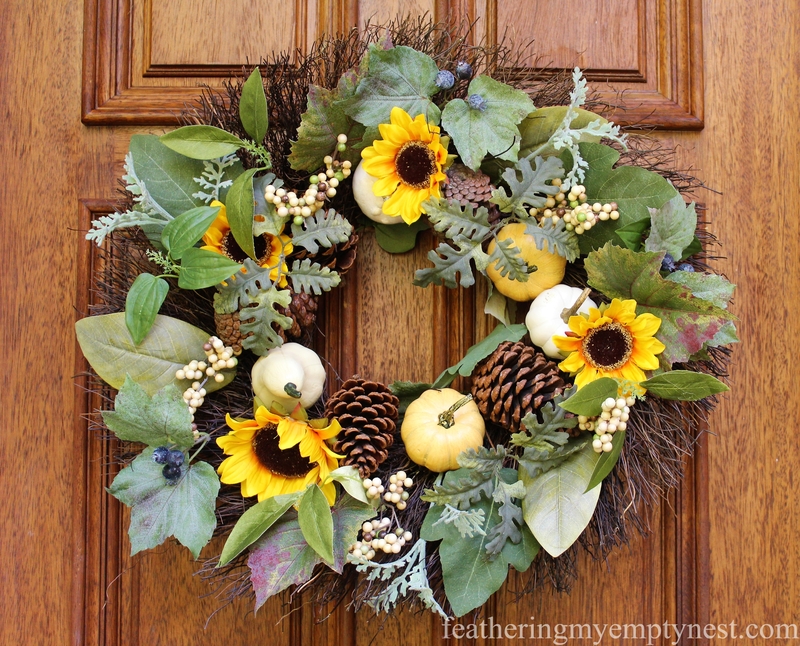 The final touch to my Fall Front Door Decor was a coordinating wreath decorated with the same sunflowers, white pumpkins, and pine cones that adorn the obelisks. The height of the obelisks, the yellow sunflowers, and the bright white of the pumpkins and the mums make an eye-catching display that can be easily seen from the road. 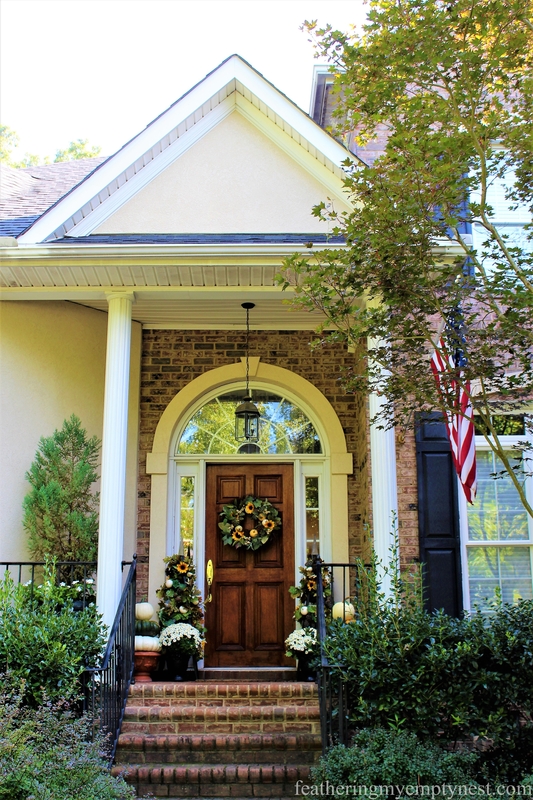 I probably should prune the shrubs around my front door, but the green in my Fall decor does tie the front door in with the greenery of the landscaping. 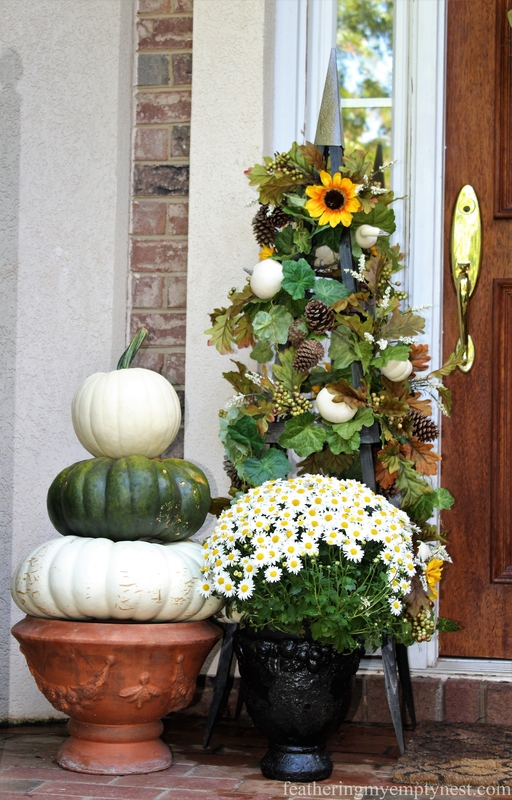 I am pleased with the way my Something Different For Fall Front Door Decor turned out. I think that the obelisks were a good investment because they can be reworked for other seasons. The pumpkins and sunflowers can be removed to make way for Christmas ornaments and lights or daffodils and tulips for Spring. And, when I get tired of using them on the front porch, I can place them in the garden and actually use them for their original purpose by growing climbing roses on them. Wow. Just lovely. I don’t even know that you need to prune the shrubs, I think they add to an overall look of lushness that the front porch has going right now. Thanks so much. You’ve given me an excuse to put the pruning on the bottom of my to-do list. Thank you so much for your kind comment. I really appreciate it! Thanks so much for your kind comment. I got my decorating abilities from my mother. Oh my word you porch area is gorgeous! I love everything you did. Beautiful color and elegant styling. Seriously pretty and welcoming! Your porch is simply stunning! Thank you so much for your kind comment on my Fall Front Porch. Thank you so much for taking the time to comment. Happy Fall! Your porch is absolutely beautiful! Love the flowers and your obelisk. Thanks so much. Happy Fall! Wow!! It looks awesome! What a creative idea. Your porch looks amazing for fall. Thank you for your kind comment on my Fall Front Porch. Happy Fall! I love this! Looks beautiful for fall! Thank you so much for taking the time to comment. I really appreciate it. Happy Fall! Your porch is one of a kind and absolutely beautiful. It certainly was worth the work you put into it. Lovely job. Thank you so much for your kind comment on my Fall Front Porch. I really appreciate it. I just love this! What a great idea to use the oblisks as a way to give your Fall decorations height so they can be seen better from the street level! Thank you so much for your kind comment about my Fall Front Porch. Thanks for the invite to your Farmhouse Friday link party. I will be pleased to link up! Your porch is so creative and so lovely! I feel you when you say you often imagine something before knowing if it actually exists – I can’t tell you the number of times I have not found what I imagine. Luckily, you did! And you really made it work so well in your porch decor. Just lovely. Love your garden fall obelisks! What a great idea! Pinned for later. Love this, so creative! I have a tiny front porch and always struggle with changing the decor from season to season. Thanks for the ideas! Love the obelisks and the stacked pumpkins. It wouldn’t be Autumn without mums. I have some old tomato cages. Wonder if I could something with them like your pretty obelisks. !!! Happy Monday! Happy Fall! Thank you for taking the time to comment. I definitely think you could use tomato cages to do something similar. 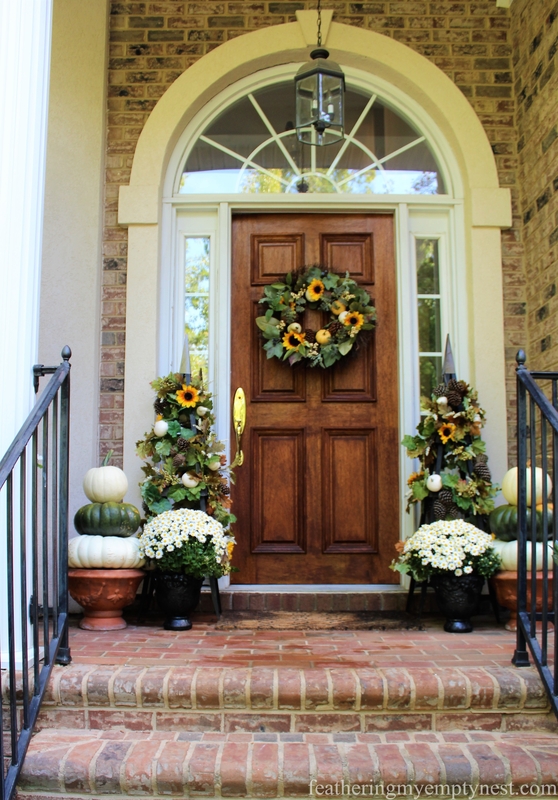 Thanks so much for your kind comment on my Fall Front Door post. I really appreciate it. Thanks very much for commenting on my post. I really appreciate it. 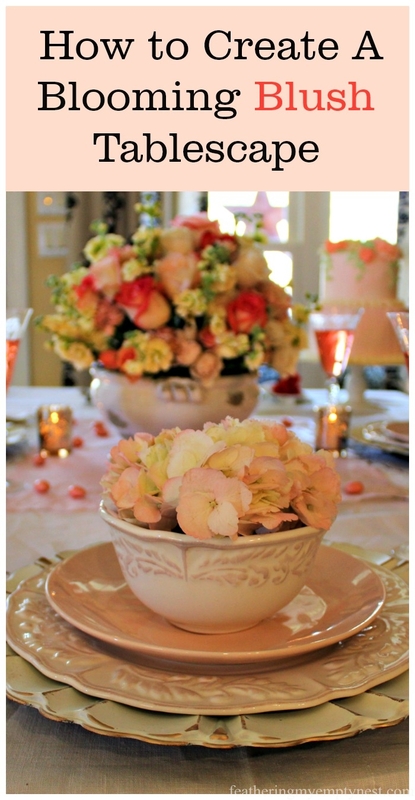 Wow, this all looks fantastic – like it belongs in a lifestyle magazine! The sunflowers look so cheery and welcoming. Thank you so much. I really appreciate your kind comment. Such a pretty fall front porch. Love the stacked pumpkins and the way you used the obelisks. So creative. Thanks so much for your kind comment. I really appreciate it! 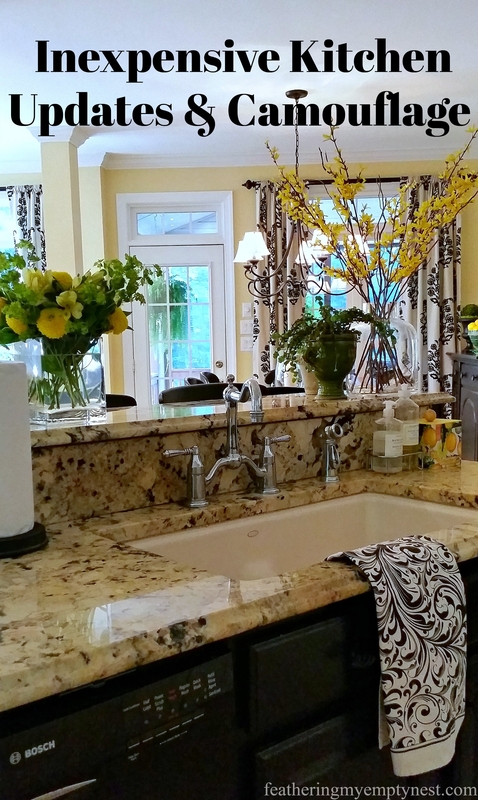 Beautifully done, your home is gorgeous and ready for fall! Thank you, Cindy. I really appreciate your comment on my Fall Front Door Decor. Happy Fall! Those obelisks are gorgeous, and you worked the entire front entry beautifully!